Just a few days before the 15 anniversary of the 9/11 terrorist attack, a significant piece of history was restored to New York. In one of the most patriotic images of that day, three firefighters stood among the rubble of the towers hoisting an American flag. 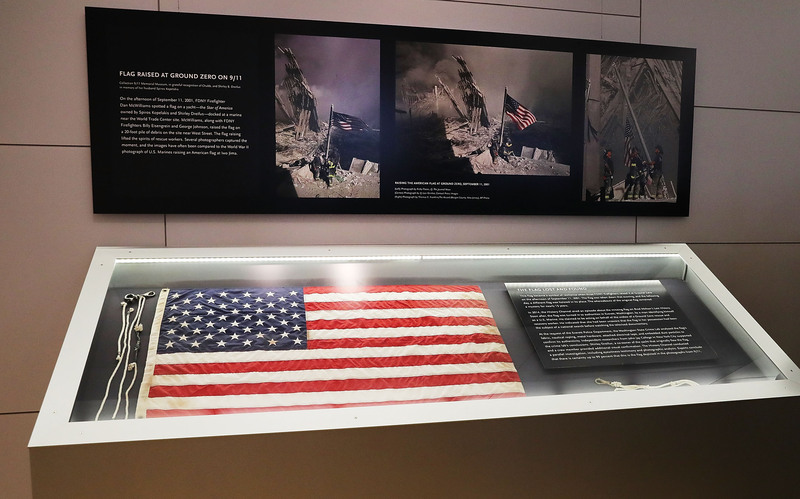 For nearly a decade, that flag was missing, but on Sept. 8, it was displayed for the first time since 9/11 in New York, where the flag will remain in the September 11 Museum. According to ABC News, on the day of the attacks, it was taken from a nearby boat before the firefighters held it up in the iconic moment of history. Afterwards, it was signed by the governor of New York, as well as by two mayors, then flown in several locations including Yankee Stadium. However, the flag that was signed wasn't the same flag that the firefighters held that day. As it turned out, the real one shown in the original photograph was missing. In 2014, the History Channel aired an episode of Brad Meltzer's Lost History centering on the mystery of the Ground Zero Flag. In the episode, Meltzer attempted to track down the lost 9/11 artifact. In 2014, the flag was found in Washington state when a man turned it in to a fire station in Everett. He had seen Meltzer's show and wanted to ensure that it was put in the right hands. According to local Washington newspaper The Everett Herald, the man said someone from the National Oceanic and Atmospheric Administration gave him the flag on veteran's day in 2007. Apparently, the NOAA employee claimed a widow of the attacks gave it to him. So how do they know that this 3-foot-by-5-foot flag is the same one, considering it's already been confused for another flag once? A forensic expert analyzed dust on the flag, and determined it matched Ground Zero debris. Police also consulted with a crew member from the yacht that formerly housed the flag to compare the materials. At the flag's unveiling at the museum on Sept. 8, museum president Joe Daniels expressed how meaningful it is to finally have the missing flag in the location where it became both iconic and incredibly meaningful. "In a museum that's filled with deeply powerful artifacts," he said, according to ABC News, "this newest of artifacts is certainly one of the most emotionally and historically powerful." In all of the tragedy and loss that the memory of 9/11 brings, having a symbol of Americans' resilience and patriotism rest in the museum to memorialize that day is beyond powerful.